Does Baby Food Diet Work? There have been many unusual ways to lose weight, from taking diet pills to eating a specific type of food. These methods may make you shed some unwanted pounds, but the side effects can be damaging to your health. One such peculiar diet plan is to consume baby food all day, mainly because it is low in calories and comes in mushed form making it very easy to digest. The baby food diet has been around for decades, but it has gained buzz recently with allegations that some celebrities and even diet gurus are eating jars of baby food to keep them skinny. Does the diet work? Liz Neporent of That’s Fit tried it for a whole day and wrote all about her experience online. Baby foods are generally more expensive – Neporent compared a jar of baby applesauce with the most expensive jar of applesauce and it turns out the former costs 30 percent more per ounce. And you are supposed to consume 14 servings of baby food in a day, which is equivalent to about 1,000 calories, making this diet a very expensive undertaking. 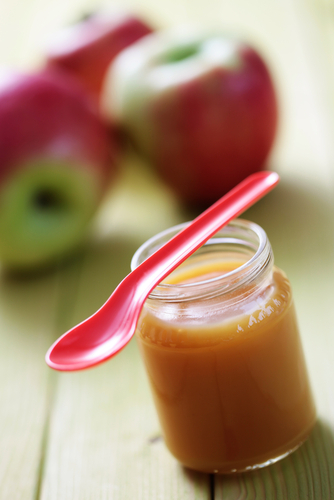 Baby foods can be very sweet – Fruit-flavored baby foods have high amounts of sugar. They can be too sweet to the point you would not even tolerate eating it. Although there are non-fruit types of baby food, the likes of mashed peas and baby pasta dinner look unappealing to eat. Some drinks do not go well with baby food – Eating baby food while drinking coffee or iced tea is unrecommended, as it leaves a bitter aftertaste. Baby foods digest quickly – If you are on a baby food diet and plan on going on a business trip, bring rolls of tissue with you. Expect visiting the toilet more often than usual. You can still go hungry with baby food – Even if you eat two whole jars of baby food as a meal replacement, you would still end up feeling nauseating because of hunger. Feeling dizzy is a consequence of consuming lesser calories than you need. Baby food diet makes you lose weight, but… – According to Neporent, the baby food diet is a twist on the concept of portion control. Although baby foods are low in fat and have few food additives, she believes that "there are healthier-and tastier-ways to eat." Try purchasing organic low-fat foods and use a kitchen scale to measure your servings. She recommends skipping this diet, except if "you are trying to get down to your original weight of seven pounds, four ounces."